this is an interview with Flo Dowling (pictured below). Enjoy! Flo has taken breaks from knitting twice. In graduate school, she was an on again, off again knitter until she started taking her knitting to class. Ironically, taking her knitting to class improved her grades. Flo is a member of my Tuesday knitting group. She knit with friends in undergraduate and knit in classes. She didn’t knit a lot in England because she was doing archeological digs and it was hard to keep things clean – but she’d pick up her knitting again whenever she wasn’t living in a tent. When I asked the question: “What’s your favorite thing to knit?” she answered, “yarn.” (haha). But she really likes textured objects rather than colored design. For instance, she’d prefer a gansey over intarsia or fair isle. According to Flo, small is good because you can carry them in your pockets (socks, mittens, caps). Needle-wise, she likes double points and circulars, doesn’t even own straight needles. I think most of my blog readers have heard me say this before, but Flo and I have very similar taste in yarn. She likes wool because it is forgiving. She loves yarn that looks like yarn and feels like it might have come from a sheep. If she was going to knit with something not wool, her first choice would be alpaca. 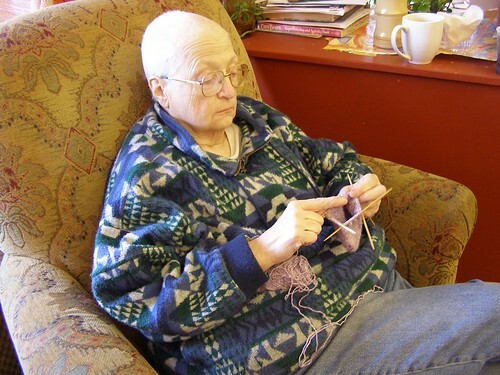 The only time she like artificial fibers blended in is if it is useful – for chemo cap yarn or sock yarn. She will take linen and silk over cotton any day. Brown Sheep is one of her all time favorite yarn producers. She likes to tell the story of how once at TNNA, she approached the Brown Sheep booth to complain about how the cuffs of her sweater were wearing out saying something like, “I’m very disappointed… I only knit this sweater 20 years ago…” They totally thought it was a real complaint. Flo especially likes low process wool like that from Green Mountain Spinnery and Harrisville – small independent people who process (or get processed on a small scale) their own wool. She is good friends with the owner of Autumn House Farm and has been known to organize weekend getaways for those in our knitting group. This love of small independent farms and businesses is one of the reasons why she really likes the new book Shear Spirit that recently came out. This blog entry by the author of Shear Spirit features a picture of Flo at Maryland Sheep and Wool getting a tattoo put on her prosthesis. Flo’s all time favorite knitting book author is Priscilla A.Gibson-Roberts. She sees her as an archaeologist of knitting – going in and finding out how other people in other times knit. 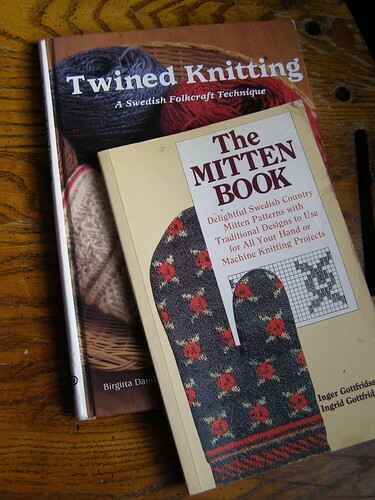 Every time a historical knitting book comes in to the store, Flo and I both need to look at it – these two mitten books are on loan from the Flo library. When asked if she does any other needle art, Flo mentioned an empty 4 ft., 8 harness Harrisville loom. She has also done lots of cross stitch and needlepoint. Currently she mostly knits, but she also gardens when the weather is nice. Flo’s basic rule of thumb when it comes to needles is the smaller the better. On her very small needles right now, she has a sock. On slightly larger needles, she has a multidirectional sweater that she’s designing as she goes along. She’s also working on the Lorna’s/Mountain Colors shawl with sleeves for the shop and has 3 ganseys done down to the wrist. I have the Monk’s traveling satchel from Folk Bags that Flo knit, but that needs to be put together. 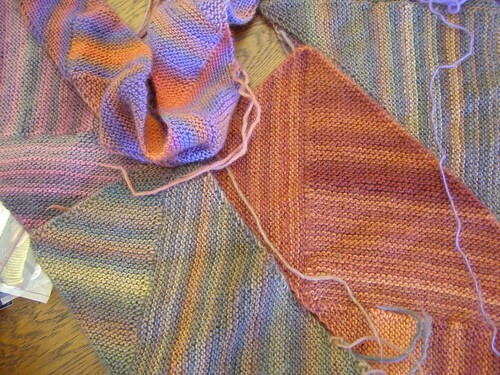 I also have numerous sweaters that Flo got bored with knitting over the years to rip apart for yarn. Flo is very much so a process knitter. If she doesn’t like what she’s doing she’ll stop. She takes the most pleasure in figuring out how to do it. She likes both designing herself and following patterns, although she admits to being not very good at following patterns, saying “I don’t know what they’re telling me.” Rather than following a pattern for a shape, she’ll go through a book on gansey knitting and put together a bunch of different things from there for her gansey. Flo’s favorite knit is “anything I’m knitting at the time or wearing at the time. I like stuff that taught me something new… so I’m always excited about a yarn I’ve never used or a stitch I’ve never learned.” She can often be found wearing and knitting socks for herself. She knits for herself because very few people she knows who don’t knit would appreciate the things she knits. That said, I’ve seen Flo suffer through 3 skeins of merino ribbon from Colinette in the name of friendship. For her to do that, though, it must be a pretty good friendship and she must know that the person will actually appreciate it. Flo likes the feel of wool in her hands, learning something new, and doing something that has been done for thousands of years. She enjoys that she has a connection with people of the past through her knitting. When asked to describe her stash, Flo said pointedly that it has decreased in size because she has been giving it away to me and Lauren. Point taken – the wool for this sweater came from her, as did these and the blue in this. Flo has taught knitting at a knitting store before, but mostly she’d say that she babbles a lot, so most people who hang around her long enough don’t have the choice to not learn something about knitting. She especially enjoys the younger people who come to knit with us, mentioning one of our regulars who is 13. Thanks Flo, for sharing your knitting life with us! If you missed my previous interview with Sue, it can be found here. This entry was posted in community, interviews, knitting by cosymakes. Bookmark the permalink. Since I am already a member of hthe Flo Fan Club (since meeting her in Maryland) I can’t think of a better way to start my week than with this post. Thanks Cosy!And a hug to Flo from me. I love these interviews — they are such a sweet way to honor a tradition and the knitters who have been at it for way longer than we have. I really enjoy these interviews. Thank you! Flo is so awesome. She always has been. But until I ran into her in Knit One, I never knew she knitted! She did get my mom hooked on cross-stitch back in the day, and my mom churns out some amazing pieces still.